Rapha is at Eurobike for the first time. First time officially exhibiting, that is. But doesn't want to open any IBD accounts. 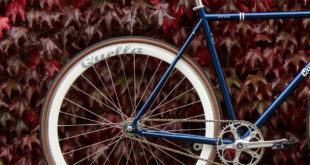 Rapha was started in 2004 as an online manufacturer and retailer of luxury road cycling clothing made from premium natural materials such as Sportwool. Five ultra high-end products were the first available: a jersey, a cycling cap, a musette, and a jacket. The company now has a turnover of £17m and has 70+ products, 45 UK staff and 14 marketing staff in key markets in the US, Japan, Europe and Australia. 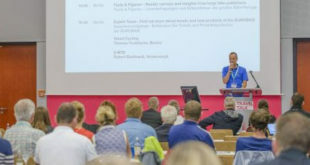 Previously known as an expert in guerrilla marketing – the company would turn up to events with its Citroën H Van, the 1950s broom wagon of the Tour de France – Rapha is now of a size it feels it needs to be a exhibitor at Eurobike, even though the company has no interest in opening retail accounts. Rapha had its new and distinctive ‘Cycling Club’ vehicle at yesterday’s Demo Day, and handed out expert pulled espressos while keen roadies watched the Vuelta on the vehicle’s big screen thanks to a rooftop satellite dish. The company was started by designer Simon Mottram, who still majority owns the business. Its HQ is a former piano factory in Kentish Town, a newly fashionable part of London. Its catalogues, website, photography and videos are as high-end as its products. According to Mottram, the first Rapha products were created to "bring new standards of design to cycling clothing. Every detail has been developed with the rider in mind. 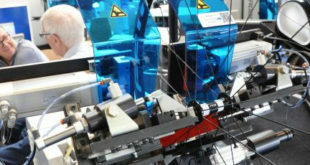 Every material has been chosen because it is the best in the world at its job." James Fairbank, Rapha’s marketing manager, said: "We need to show product, so people can feel it and touch it, rather than seeing it just through the website. But we’re not looking to add wholesale or retail partners to our base. 85 percent of our business is still done online, we don’t need to change that approach." Rapha launched ‘pop up’ temporary shops in London and San Francisco 18 months ago. These proved financially viable so have become permanent retail outlets. "There’s been such an incredible explosion of interest in cycling in the UK the last six months, 12 months, 18 months. We keep having to reset our targets in the UK because another mini-revolution occurs. But we see more long-term potential growth in the US because the market’s that much larger." At Eurobike, Rapha can reach an international audience. "We’re here to show product to the industry at large," said Fairbank. "Our fundamental business objective is to help grow the culture of road cycling and this show is key to that. We can’t keep turning up to shows with our van outside and then not exhibiting. That’s not fair to the show organizers. Guerrilla marketing is appreciated when you’re small but it gets tiresome when you’re that much bigger." 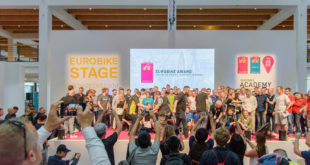 He added: "Exhibiting at Eurobike is a key part of cycling culture." Rapha’s £17m turnover doesn’t include cover sales or advertising revenue for the upscale road cycling magazine, Rouleur, a magazine originally part of the Rapha empire. The magazine was later rolled up into a separate business, in separate premises, and a premium mountain bike magazine was added, Privateer.